Double Olympic pole vault champion Yelena Isinbayeva has announced she will run for president of the Russian Athletics Federation (ARAF). Russian track and field athletes were banned from the 2016 Olympics following claims of state-sponsored doping. The 34-year-old, who won gold in Athens and Beijing, was among 68 athletes to appeal against the ban. "The chance to help Russian athletes return to the elite is a huge motivation for me," she said. "It will be some sort of compensation for not being able to compete in Rio. I want our athletes to take part in international competitions." Isinbayeva, who has never failed a test in her career, wants to replace Dmitri Shlyakhtin when he steps down in November. Russia was suspended from track and field events by the International Association of Athetics Federations (IAAF) in November 2015 following the publication of an independent World Anti-Doping Agency (Wada) report that showed a culture of widespread, state-sponsored doping. 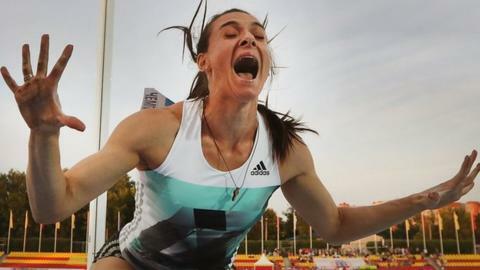 "The ARAF has a difficult path ahead in trying to return to international athletics," added Isinbayeva. "The fact that I was not allowed to compete in the 2016 Olympics will help me to try to make sure that the ARAF is a member of the IAAF again."